DO YOU RENT? YOU WON’T WANT TO MISS THIS INFORMATIVE AND FREE WORKSHOP! 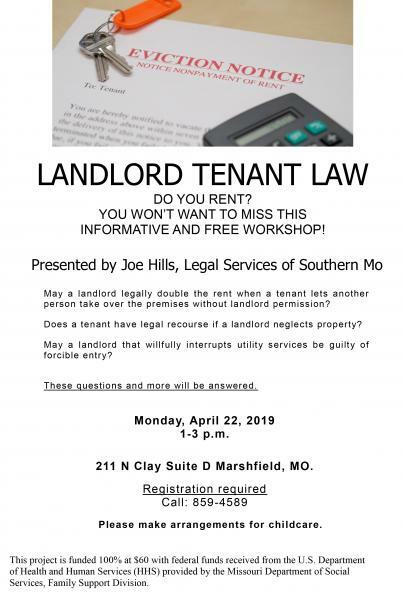 Presented by Joe Hills, Legal Services of Southern Mo May a landlord legally double the rent when a tenant lets another person take over the premises without landlord permission? Does a tenant have legal recourse if a landlord neglects property? May a landlord that willfully interrupts utility services be guilty of forcible entry? These questions and more will be answered. Monday, April 22, 2019 1-3 p.m. 211 N Clay Suite D Marshfield, MO. Registration required Call: 859-4589 Please make arrangements for childcare. This project is funded 100% at $60 with federal funds received from the U.S. Department of Health and Human Services (HHS) provided by the Missouri Department of Social Services, Family Support Division.